In some Indian villages, women and children walk long distances to find drinking water - and it is not always safe. With the help of our donors, in 2007 alone, Children's Hope funded wells in 26 different villages in India – giving the gift of clean drinking water to thousands. Contaminated water is the main cause for diseases like cholera, typhoid, diarrhea, hepatitis A, and dysentery; worldwide, every 8 seconds a child dies from a waterborne disease. You can imagine the excitement then, of seeing hundreds of mothers and children coming to a well to get clean water where previously there was none. 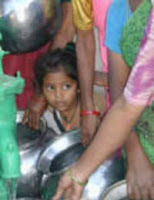 On World Water Day, join us in improving the lives of many by contributing to Children's Hope Wells in India cause, here. All gifts are appreciated and will be combined together towards digging a fresh-water well for a village in Southeastern India. For more information please visit www.HelpAnOrphan.org or, to get your child's school involved, email projects@ChildrensHope.net.